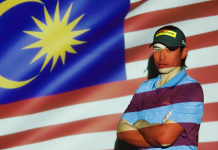 Malaysia, November 10: American John Catlin edged closer to a second victory on the Asian Development Tour (ADT) after signing for a five-under-par 67 to maintain his one-shot lead following the penultimate round of the PGM EurAsia Perak Championship on Friday. 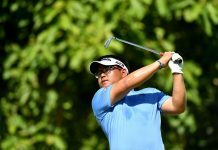 The 26-year-old Catlin, who sits in fifth place on the current ADT Order of Merit, traded eight birdies against three bogeys to sit atop the leaderboard with a three-day total of 11-under-par 205 at the Damai Laut Golf and Country Club. 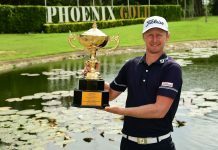 Australian Martin Dive returned with the day’s lowest round of a 66 to take second place while Thailand’s Panuwat Muenlek (70), American pair Josh Salah (69) and Paul Harris (71) shared third on 210 at the RM200,000(approx.US$44,600) ADT event. Catlin, who has notched five top-10 finishes this season, took advantage of his hot putter to put himself in prime position for a second victory on the region’s secondary circuit. “I putted really well. I made a good birdie on hole 14, where I hit my nine-iron to a foot from the hole before tapping it in. I birdied all of the par fives except for hole 18 which was pretty upsetting as I only had a short approach in. I left a few out there and I am hoping I can finish it off tomorrow,” said Catlin. Dive, playing in his first year in Asia, was thrilled to return with a flawless round highlighted by four birdies in his front nine and a closing eagle on the par-five 18. “Putting was key for me today, I felt very comfortable around the greens and holed a couple of long putts, including a 50-footer eagle putt on 18, which was a nice way to end a great round,” said 32-year-old Dive. “It has been a struggle for me the past few months but I can feel everything is starting to click and I am hitting some good shots this week. I have got a way of playing this course and I will stick to that game plan and take it one shot at a time,” added Dive, who won his first ADT event earlier this year. Salah remained optimistic of putting up a strong final day charge after marking his card with six birdies against a double-bogey and one bogey. 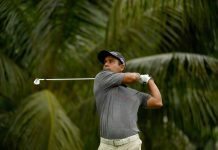 “I was pretty aggressive with my drive on hole nine which ended up out-of-bounds so I had to settle for a double bogey. But I am happy with how I played this course the past three days and I am going to play my own game and see how low I can go tomorrow,” said the 26-year-old Salah. The PGM EurAsia Perak Championship, jointly sanctioned with the Professional Golf of Malaysia (PGM) tour, is the 17th leg of the ADT schedule and the 10th stop in Malaysia this season.